Remember Ringling College of Art and Design Senior Illustration Show will be NEXT FRIDAY MAY 1ST! On campus from 6-9 opening night and if you can not make it opening night the show will run from the 1st to the 4th! All twelve of my illustrations and process work will be posted after opening night and I can't wait to share it! 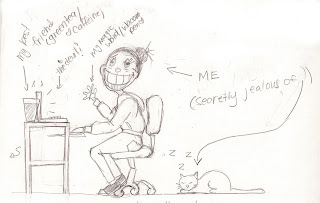 For now I leave you with my silly doodle that is o so accurate back to work.